Reliance Jio has extended its free voice and data offer till March 31, 2017. Reliance Industries Chairman Mukesh Ambani announced that Jio is introducing 'Happy New Year Offer' which gives access to free data and voice calls till March 31, 2017. All existing Jio customers will continue using 'Free Welcome Offer' till December 31 and will automatically be migrated to 'Happy New Year' offer. Happy New Year Offer: With TRAI making it clear that Jio's Free Welcome Offer can't be extended to new subscribers post December 3, 2016, the company is introducing 'Happy New Year Offer.' The new offer will be available from December 4, 2016 to March 31, 2017. Under the new offer, subscribers will get free voice and mobile data but there is a catch. Reliance has downsized the FUP from 4GB to 1GB per day. "On New year day all free wlecome offer will be migrated to Jio New Year offer," said Mukesh Ambani. Reliance Jio Happy New Year Offer vs Welcome Offer: What's Changed? Reliance Jio says it has experienced data issues because of extensive usage and feels 1GB per day is enough for more than 90 percent of its consumers. 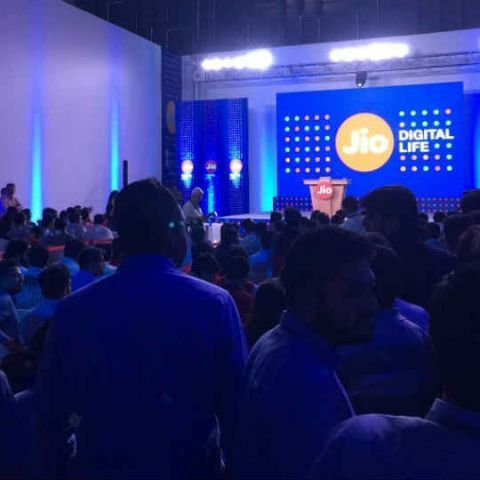 The company will also offer access to the suite of Jio apps, which bring services like live TV, on-demand movies, mobile wallet to name a few. Reliance Jio subscriber base: Mukesh Ambani confirmed that Reliance Jio has grown to over 50 Million subscribers since its launch on September 1. "Reliance Jio has grown faster than Skype, WhatsApp, Facebook and continues to set a new trend in the road towards digital and connected India" Ambani said, "India is on the path to top 10 digital countries in the world and with Jio, more subscribers will be connected than ever before." A recent report indicated that Reliance Jio is adding nearly 1,000 subscribers every minute and the company says its adding 6 lakh new subscribers a day. For the record, Airtel has 262.67 million subscribers, while Vodafone and Idea have 201.9 million and 180.25 million subscribers respectively. On Call drops and Data speeds: Reliance Jio is definitely plagued by call drops and the company thinks its services suffered due to competition and lack of interconnect points. Ambani assured that all domestic voice calls will be flawless going forward. At the stakeholders meeting, Mukesh Ambani said, "Jio customers are using 25 times more data than average consumers and the Jio Welcome Offer was used only to get feedback about the service." In terms of numbers, he claimed only 8 percent of its existing consumers experienced data congestion issues, while 92 percent subscribers experienced top-class data speeds. Reliance Jio plans to decongest 8 percent towers in order to deliver great experience to all its users. On eKYC and Free SIM delivery: Reliance Jio now fully supports MNP. The company says this will help single-SIM smartphone users easier to switch to Jio without changing their numbers. He said eKYC is available across 2 lakh outlets in India and it is aiming for a progressive launch of home delivery of SIM cards. On Demonetisation move: Further, Ambani was totally in praise of the Government for its demonetisation move. He said, "We applaud demonetisation move and with Jio Money, will enable digital transformation of the nation." JioMoney: With JioMoney, Ambani wants to lead the digital recharge and payments platform. He said "JioMoney is focused on signing up 10 Million customers and JioMoney merchant solution will allow digital transactions at small merchant locations from December 5." JioMoney Merchant Solution is aimed to connect merchants, even at small mandis, with digital payments. The service will be directly linked to bank accounts and merchants can even pay suppliers with JioMoney. With JioMoney, Reliance Jio is going after the likes of Paytm, FreeCharge and Mobikwik and can essentially better these services thanks to its wider network. It is unclear how Reliance Jio will decongest its network towers and it is surprising how the company even came to that 8 percent number. Mukesh Ambani's speech certainly brings reassurance that the service will be top notch before March 31, 2017, and will eventually help digital transformation in the nation. He ended his speech by saying, "Thank You for trying Jio, using Jio, improving Jio and loving Jio."